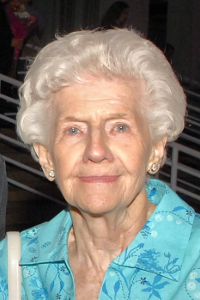 ALBANY – Joan Simonin Joyce left this life peacefully and with characteristic humor on April Fool’s Day knowing she had enjoyed a well lived life, surrounded with the warmth and godspeed wishes of her loved ones. Joan arrived March 29, 1923, a first generation American born to Amedee Simonin of France and Bertha Verenne of Belgium in Albany’s West End. In the melting pot of Albany, she spoke only French until entering school, where she quickly mastered English and loved the adventure of learning. In 1929 at the beginning of the depression, Amedee died, leaving Bertha and 7 children. Bertha gathered the family together, took in railroad workers as weekly boarders, and 6-year-old Joan learned the value of resilience, hard work and determination. Her brothers’ paper route covered much of Albany and sustained the family through the depression. Joanie spoke fondly of being old enough to add inserts and fold Sunday papers as her early family contribution. She loved the thrill of being taught to ride on the bike fender, throwing newspapers onto porches, which she learned with precision. Persuading Bertha to give her an allowance from the family’s hard-earned income, she enjoyed tap and swing dance lessons. 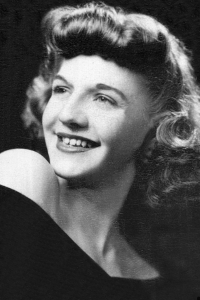 An avid learner, Joan became a teacher at the Murray Dance Academy, and contributed to the family coffers. She also taught dance and organized variety shows for St Anne’s Institute, becoming a source of inspiration for a generation of young girls. For her entire life, Joan brought cheer and laughter to a room by engaging everyone in dancing when hearing Big Band or Engelbert Humperdinck music. Graduating from Mildred Elley in 1941, Joan began work at GE Schenectady. Her competent skills along with her lively spirit made her a highly requested typist in the secretarial pool. When men left to serve in WWII, Joan was selected to learn “drawing” and loved the precision and challenge of her new job. Only years later she learned she had been a valued member of the drafting department. When the men returned in 1946, she was sent back to the secretarial pool but found a new passion. Early television was being developed by GE, and Joan choreographed and performed dance routines on the first TV variety shows. 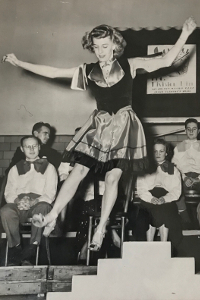 The engineers built her stage sets for tap dancing, and she became a popular performer. Joan was a woman of strong Catholic faith. In 1945 she followed her calling becoming a postulant at the Sisters of the Blessed Sacrament in Philadelphia, founded by St. Katherine Drexel. Joan’s penchant for organizing dance shows for the older sisters’ enjoyment, and friendly talking with neighbors on the nun’s daily walks brought several talks in Mother Superior’s office. After a year, Joan and Mother Superior mutually agreed that religious life wasn’t her vocation. But she had a life- long devotion to Blessed Mary and always had a rosary or icon within easy reach and homage. She was a member of church Rosary Societies and prayer groups in Blessed Sacrament and St Vincent’s parishes. Returning home, Joan was welcomed back at GE and loved organizing company dance parties and gatherings. In 1946 she caught the eye of a returning war hero, a handsome Irishman, when he drove her to a Sodality weekend with his sisters. She married Ray Joyce in 1949, and Joanie quickly became beloved by his large family. Family legend recounts two elderly aunts placing a bet over who would rule the marriage, and the joke became that they both won. For 65 years until Rays passing in 2014 they lived life in loving unity. Throughout Ray’s military, state and political careers, Joan anchored the family as homemaker but not home stayer. Her knack for inclusiveness and crafting fun activities created a playground mecca in her backyard for the neighborhood children. Her love of life made family vacations at local lakes the center of extended family gatherings. Among Joan’s volunteer activities were Girl Scouts, untiring volunteer for her children’s schools, food pantries and soup kitchens well into her 80’s. In retirement, Joan and Ray poured energy into civic, church and family activities. As mainstays in the early days of the Albany-Tula Alliance, they organized packages and visited Russia, forging bonds with Tula families. In Tula, Joan was thrilled to be tasked with vising churches and religious leaders as the Alliance’s representative. They also traveled to Ireland with the Albany Pipe Band to celebrate their march in the St Patrick’s Day parade. They welcomed all to their Ballston Lake summer home for BBQ’s and boating. Joan’s pleasure was patiently teaching 500 Rummy and Scrabble to all young visitors, sharing the secrets of triple word scores and difficult words. With Joan’s behind-the-scenes support, Ray achieved many civic accolades and awards. Joan was truly ahead of her time. Living within the norms of the 50’s and 60’s, she never let society’s vision of women confine or define her. She lived life head on, with verve and generosity, never preaching to her six children but modeling broadminded values and social justice to all. Her home was open to all, and she had the expansive nature to change with the times. Joan loved the energy of sharing with young people, donating her body to Albany Medical Center’s anatomical gifts program to educate a new generation of medical professionals. Knowing Joan, her spirit will infuse students with the passion of knowledge and life. Special thanks to Community Hospice for their caring and support, to the Avila family for creating community and home during Joan’s last 8 years, and for special friends Rebecca Faucett and Gloria Orlup, and Hospice nurse Eileen Fitzpatrick, who eased Joan’s last days. Celebrating her life are children Janice Joyce (Henry Frueh), Michael Joyce (Judy), Daniel Joyce (Patty), Mary Joyce, Patricia Joyce-O’Toole (Tom), Therese Joyce (Tom Schmidt). Grandchildren: Mark Singiser (Ryan Healy), Christopher and Patrick Joyce, Jared (Catherine) and Robert Joyce, Cassia and Megan O’Toole, Ande Joyce Jolley, great granddaughter Haisley Joyce, and large extended family. A mass of Christian burial and celebration gathering are planned for early summer. Gifts in her memory may be made to Blessed Sacrament School or Sr. Maureen Joyce Center in Albany. To leave a message of condolence for the family, please visit www.HansFuneralHome.com. What a lovely tribute to an amazing woman who so obviously thrived on the adventures of life, loved and lived extravagantly, and was abundantly loved in return! She sounds like she was an extraordinary wife, mother and friend. Praying for comfort and peace as you grieve. What a lovely tribute. She was quite a woman ahead of her time. My thoughts and prayers are with those who loved her. I have been blessed to learn to know the amazing and joyful children of Joan Joyce. It speaks volumes about Joan’s values, spirit, and mothering to see how her love and grace has spread throughout the world through the lives of her offspring. So glad that the family were able to gather round her in the final days and send her forth. Joan was held with love…. and she poured love into the world. May that spirit surround the family as they celebrate Joan’s life. Please accept our deepest condolences for your loss. She was an amazing woman, who lead an amazing life, as well as raising an amazing family. Her legacy will live on forever. Stay strong and close to each other. And take comfort in knowing that you will be reunited again. Such a lovely tribute. I wish all of you comfort and peace. Janice I was so sorry to read of the passing of your mother. It was a beautiful tribute in the papers. There are no words but know that you are in my thoughts and prayers. We are made of energy and Physics teaches us that energy never ceases to exist it just takes on another form.